Another upfronts season is drawing to a close: The broadcast networks have duly given thanks for a bountiful harvest of pilots, though they haven’t really gotten down to the business of carving up that big, plump platter of advertising dollars just yet. So while NBC, Fox, CBS, and ABC withdraw to the kitchen to make those final preparations and snipe at one another about who’s really America’s favorite (always keeping one guilty eye on that leftover How I Met Your Dad), they cede the floor to the kids’ table. The CW has been to enough of these things now that it’s allowed to use real silverware and get its own second helping of Jell-O (though Jell-O’s more of a CBS brand), and its small-time strategy of emulating its cool, older cousins who are off at cable is sound enough that it doesn’t have to make any big moves year to year. It also means it doesn’t have to pay as close attention to old-fashioned TV concerns like overall viewership, because that stuff’s for adults—and geez, Dad, don’t you know that nobody watches TV on a TV anymore? As such, there’s not a tremendous amount of shakeups in The CW’s lineup for fall 2014. It’s only programming two new series, with two other rookies—Rob Thomas’ iZombie and the pre-apocalyptic drama The Messengers—waiting in the wings alongside returning series Hart Of Dixie and Beauty And The Beast. There might not be a lot here to analyze, but like any hearty holiday feast, The CW left a few scraps to tide us over—mostly at the beginning of the broadcast week. Here’s where The CW’s using its positioning in the upfront schedule to its advantage. On Tuesday, Paul Lee took the stage at Lincoln Center, and after threatening assembled world leaders that he would melt the polar ice caps if his demands weren’t met, announced that Marvel’s Agents Of S.H.I.E.L.D. is moving to 9 p.m. on Tuesdays. 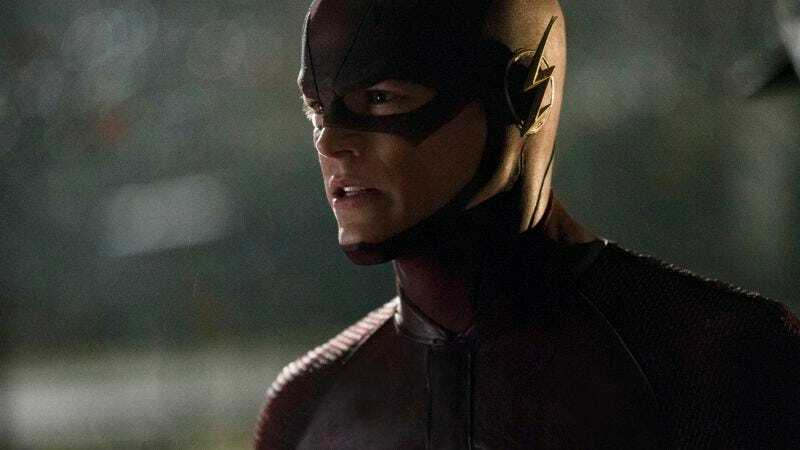 Agents isn’t the megahit everyone was expecting, and The Flash can really only eat into its Nielsen rating for viewers under 50, but in this case of the unstoppable force versus an immovable object, the Scarlet Speedster goes fast enough to jump back one hour. Supernatural should be kicking off the night, but it’s increasingly old and creaky and has to make way for the spin-off that would presumably take its place after retirement. See, The CW is the perfect home for The Flash: It loves legacy stories. And now, the intro and end credits from the 1990 version of The Flash, artifacts from a time when Tim Burton’s Batman movies (and not Christopher Nolan’s Dark Knight or the Marvel Cinematic Universe) dictated what superheroes looked and sounded like (check out Shirley Walker and Danny Elfman warming up for Batman: The Animated Series) on television. This embed also included because everything after Tuesday winds up incredibly boring. After The Vampire Diaries, Arrow was the second step toward The CW establishing its current programming identity. Critical accolades and steady viewership should keep it in the Wednesdays at 8 slot for the time being—and from here, the network can use the show as a shield (not “a S.H.I.E.L.D.”) for the lone survivor among The CW’s 2013-14 spate of science-fiction shows. Judging solely by the one email The A.V. Club recently received about adding The 100 to regular TV Club rotation, the “future teens repopulate the Earth while their parents scheme from outer space” show has touched a nerve. Pairing it with Arrow also indicates that most of the nerves touched by The 100 are male nerves—or simply nerves that can appreciate a good set of abdominal muscles. Need any further proof that the TV world has gone all topsy turvy? In 2013, this lineup was the subject of The A.V. Club’s “This pairing makes no sense!” skepticism. Well, you know what, A.V. Club circa 2013: You make no sense. Despite receiving the Originals-Jane The Virgin Special last year, The Vampire Diaries leading into Reign makes all the sense in the world now. The only way it could make more sense is if The Vampire Diaries figured out a way to integrate all of the prophecies of Reign’s Nostradamus into its timeline. 8 p.m.: Whose Line Is It Anyway? Stay tuned tomorrow for Todd VanDerWerff and Sonia Saraiya’s thoughts on the new CW trailers, and keep an eye on Newswire for more stories trickling out from the network’s upfront presentation—like spin-offs for both Supernatural and [Rubs eyes in comedic fashion, as if something is on their surface and impeding his vision.] Veronica Mars! ?